The 2008 US Open’s fourth round was completed today and I say fourth round, not final round, for a reason. 54-hole leader Tiger Woods shot a +2 round (73) to end all four rounds combined at a -1 (283). 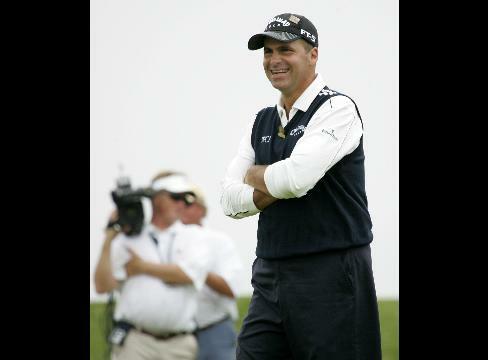 However, unknown Rocco Mediate, ranked 158th in the world rankings, shot an even par round (71) to also end all four rounds at a 1-under (283). With Mediate and Woods tied, they will play 18 more holes tomorrow morning to decide the winner of the 2008 US Open. As much as I was looking forward to watching someone raise the US Open Trophy today, I have no problem watch Tiger and Rocco duke it out for 18 more holes tomorrow on one of the toughest courses in golf. For Tiger, he should be thankful to even be in the playoff, but also worried about how is surgically repaired left knee will handle another full round of golf. Having never lost a major championship when he had a 54-hole lead, Tiger looked to be in some trouble early after he double bogeyed the first hole and bogeyed the second. As the round progressed, Tiger continued to flutter around even par for the remainder of the round, but his left knee caused him to grimace after nearly every shot. Having never had knee surgery myself (especially not three times on the same knee), I have no idea the amount of pain that Tiger was feeling. However, I can’t help but believe that Tiger may have embellished a little bit. That’s not to say he wasn’t in any pain, but I think that Tiger may have exaggerated the pain slightly to make a victory at Torrey Pines seem that much more incredible. Whether or not he was in pain, Tiger’s comeback on the par-5 18th was nothing short of incredible. Down a shot on the final hole, Woods drove his tee shot left into a bunker and then hit a poor lay-up shot which left him about 80 yards from the hole, but in deep rough. Tiger then hit two classic shots. With very little green to work with and unable to put any spin on the ball, Tiger hit a perfect chip shot which left him with a 10-foot putt for birdie. It came down to that one putt: Make it and force a playoff, miss it and go home. Breaking a couple of inches right to left, Tiger pushed the putt a tiny bit, but got a kind roll from the cup as it circled 180° around the hole and dropped in for birdie.